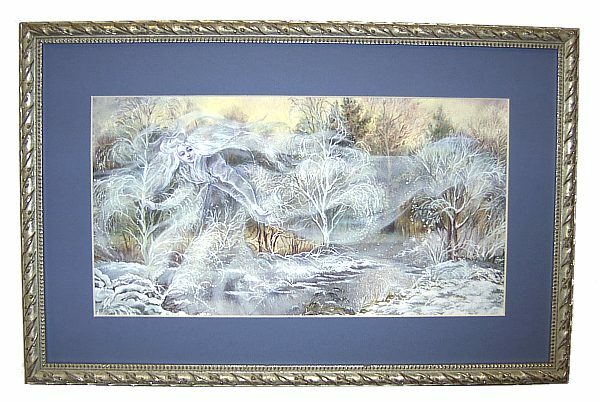 Wouldn't this fine art reproduction, entitled "Winter in Russia", look great in your house? Tradestone Gallery and Lacquerbox.com present their first in a series of high quality giclee prints, all taken from the artwork of notable and original Russian lacquer boxes. This print, which measures 15.5 inches by 8.25 inches, was first done on a smaller lacquer box by the well regarded Fedoskino artist Viktoria Sinelnikova and features a beautifully creative personification of winter. The box has already been sold, but through the latest digital photo and computer technology, the work is now being made available for more people to enjoy in the form of this gorgeous giclee reproduction. The artist herself has authorized this limited edition of 100 of the prints and a signed certificate by Sinelnikova will be included with each. As an added bonus, a truly lovely catalog from the artist, which includes some of her top works like this one, will be included with the print at no additional charge. This price for the giclee print is only $39.95 (which includes the catalog). But don't wait too long to order, we don't want to miss out on this second chance to enjoy the creativity and beautiful work of one of Fedoskino's most distinguished artists. Prints come unframed and unmatted. The above is only one suggested way to display it. We invite you to have the frame and mat made to your own specifications and/or to match the decor in your house. Contact your local framer for advice or place your order at a reputable website like framesbymail.com and have it delivered to your door.